55 miles off the coast of Florida, the Sheraton Our Lucaya Beach & Golf Resort is in the heart of Grand Bahama Island. Set on 7.5 acres of sandy beaches with sparkling blue waters, tropical surroundings, and a children's activity center, the Sheraton is the ideal choice for golf enthusiasts with families looking to relax and enjoy quality time together. The hotel’s 468 guest rooms and suites are tastefully decorated to create a really relaxed atmosphere: the sand-colored walls, honey-toned furniture, and brightly colored fabrics have a decidedly soothing effect, a feeling of paradise rarely found in a resort hotel. All of the rooms and suites feature Sheraton Sweet Sleeper Beds. I wasn't quite sure what these are, but apparently they are private labeled to Sheraton specification to ensure the ultimate good night sleep. If that’s really true, I can’t say. What I can say is that they certainly look inviting. Most people/golfers visit Grand Bahama as a family, so a full itinerary of activities and amenities is important. The Sheraton, Our Lucaya, offers an abundance of activities for families to share together or separately. Pool games, crafts, and athletic competitions are offered daily around the pool and on the beach. And I can promise you the kids will love the sand playground and 35-foot-diameter wading pool. For an additional fee, Camp Lucaya offers supervised activities for children age 3-12. The grown-ups will appreciate the Sugar Mill Pool, with a 60-foot-high stone tower and "quiet" section with an adjacent 10-person spa tub. If you like to take a chance at cards or the slots, the new Isle of Capri Casino at Our Lucaya offers 400 slot machines and 30 game tables, with a high limit slot area as well as a high limit room for table game players. Not just for the ladies, there’s a 25,000-square-foot Senses Spa & Fitness Center. The resort boasts 14 restaurants and cafés so the dining options are seemingly limitless. Finally, there are the two magnificent golf courses – The Reef and The Lucayan – and that, after all, is why we’re here. 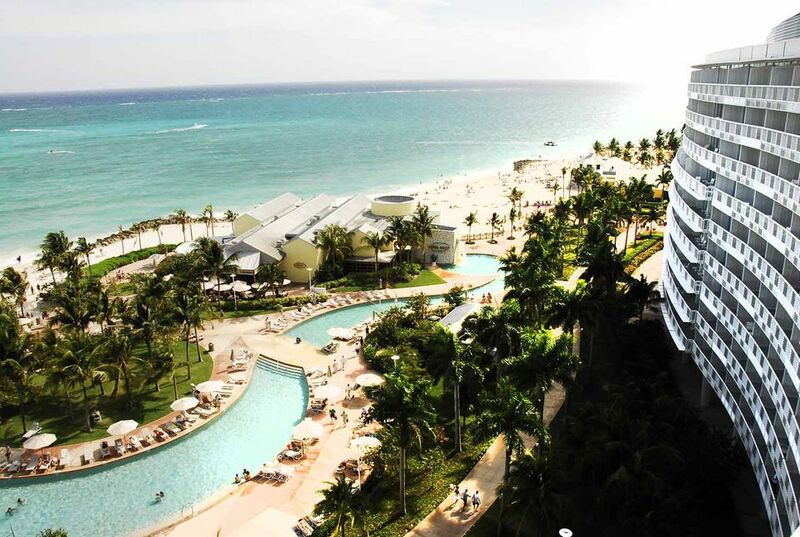 The Sheraton shares its 372-acre resort complex with a sister hotel, the Westin Grand Bahama Island Our Lucaya Resort. Guests at the Sheraton enjoy full access to all resort facilities and activities. So, I do believe the Sheraton Our Lucaya Resort offers great opportunities for a Golf in the Bahamas family vacation. The Islands of the Bahamas are served by two international airports: Nassau International Airport and Grand Bahama International Airport. These two airports are served by almost all of the US domestic airlines as well as airlines from Canada, the United Kingdom and Europe. Travel to the Out Islands of the Bahamas is achieved via Bahamasair. Bahamasair offers regular scheduled service to the Abacos, Exumas, and most of the smaller inhabited islands. Travel to the Abacos and The Exumas can also be achieved via the Fast Ferry from Potter’s Cay in Nassau – daily scheduled service is available. This is a great way to visit the Out Island. I highly recommend it. Rental cars are readily available at both international airports. I truly hope that you enjoy your visit to the Bahamas as much as I always have.